﻿ Spain - Walking on the Camino - Cebreiro to Santiago de Compostela. Spain - Walking on the Camino - Cebreiro to Santiago de Compostela. Last 8 days of walking on the Camino Frances from Cebreiro to Santiago. Experts of the Way of Saint James in Spain and in France for more than 20 years. This is a self-guided walking tour : we reserve the rooms, the dinners, luggage transfers from hotel to hotel, and provide the road book and the maps and an assistance. El Camino Frances or French Way, starts in France in the Pyrenees in Saint-Jean-Pied-de-Port, goes down to Logrono, Burgos and Leon and continues with O Cebreiro to reach the final destination in more than 30 days, Santiago de Compostela ! This is a nine day section that we propose here, but we can reduce the number of nights or add some more, and we can propose the whole itinerary starting from Saint-Jean-Pied-de-Port or even from Le Puy en Velay in France. Chemins de France is the company expert of the Way of Saint James for more than 20 years . After weeks of sunburned lands, the footpath continues through Galicia! Green cultivated lands, corn and rye fields, vineyards, forests, torrent-like rivers, Galicia is a Celtic region that is from another time and is the end of the road, arriving in Santiago and bathing in the unforgettable fraternal atmosphere that reigns here. Starting point of the Galicia, El Cebreiro with its cottages “les pollazas” and its church from the year 1000, a walk back to the legends of Middle Ages. El Cebreiro – Triacastella. 21 km- 5h30 walk. A very beautiful ridge path leads up to the San Roque Pass and then starts a long descent towards Triacastela, from hamlets to hamlets. Triacastella – Sarria 21 km- 5h30 walk. Here you are in the rolling Galician landscape, uphills and downhills, farms and brooks, chapels and wayside crosses. Sarria - Portomarin – 21.5 km – 5h30 walk. After a short drive from Samos to Sarria, the way crosses over a medieval bridge and through a Chestnut tree forest, from one hamlet to another linked by trails bordered by high stonewalls. In Portomarin the San Juan fortified church is worth the visit. Portomarin – Palas del Rei – 24 km- 6 h walk. The way continues through peaceful villages to Hospital de la Cruz where begins eucalyptus forests. Arrival in Palas del Rei. Palas del Rei – Arzua – 26km – 6h30 walk. On the way admire and observe the beautiful traditional houses. Arrival in the historical city of Arzua. Arzua- Labacolla- 26 km- 6h30 walk. Another long day which is very important before reaching St James : here the tradition among the pilgrims is to wash before honouring St James. Labacolla- Santiago- 12 km – 3h walk. The last walk to the Monte Gozo, before walking under la Porta do Camino (the Door of the Way) that opens on Santiago de Compostella. End of your travel after breakfast. Please contact us if any of these walks seem too long and we will try our best to offer you a choice by shortening them depending upon available hotel space. 695 € per person in double room. 815 € per solo traveler in single room. 760 € per person in double room. 890 € per solo traveler in single room. Departure period : from 01/03 to 31/10. 2 and 3 star hotels and Guest Houses. En suite bathrooms. Single rooms possible. Half board from dinner day 1 to breakfast day 9, except dinner in Santiago. Day 8 dinner in Santiago. Visits. Drinks. Travel insurance. directly to their bank account. 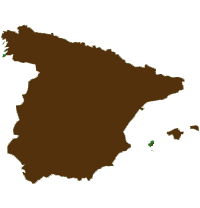 Starts in : El Cebreiro, Spain (6 km from Piedrafita). Access : Ponferrada train station. Line from Hendaye via Irun to Ponferrada. Then transfer by local transportation. Click on "ask for more information" below. Customize your stay : combine with another section of the Way ; add or remove 1 night or more !